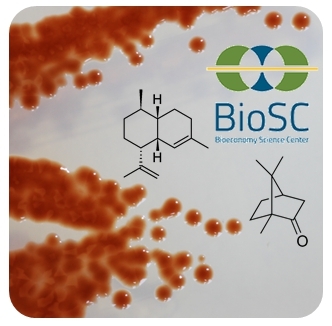 The conversion of plant-derived biomass to high-value products such as nutrients, fine chemicals, pharmaceutical building blocks or natural products with pharmaceutical activities is the key towards a sustainable bioeconomy. For this purpose, versatile microbial platform organisms for the production of such compounds are needed. This project aims to develop microbial cell factories with an emphasis on the production of plant natural products (PNPs). The construction of microbial cell factories requires the effective construction of artificial metabolic pathways and compatibility between bacterial and plant biosynthetic pathways PNP-Express aims to develop: (i) bioinformatics tools and databases for the reliable identification of pathways for PNPs in plant genomes and (ii) microbial platform strains with increased PNP-precursor levels through metabolic engineering. The total budget of PNP-EXPRESS is € 427,680.00. PNP-EXPRESS is part of the NRW-Strategieprojekt BioSC and thus funded by the Ministry of Innovation, Science and Research of the German State of North Rhine-Westphalia. Hartl, K, Denton, A, Franz-Oberdorf, K, Hoffmann, T, Spornraft, M, Usadel, B and Schwab, W (2017). Early metabolic and transcriptional variations in fruit of natural white-fruited fragaria vesca genotypes. Sci Rep 7: 45113. Lang, V, Usadel, B and Obermeyer, G (2015). De novo sequencing and analysis of the lily pollen transcriptome: An open access data source for an orphan plant species. Plant Mol Biol 87(1-2): 69-80.
van Summeren-Wesenhagen, PV and Marienhagen, J (2015). Metabolic engineering of escherichia coli for the synthesis of the plant polyphenol pinosylvin. Appl Environ Microbiol 81(3): 840-849.
van Summeren-Wesenhagen, PV, Voges, R, Dennig, A, Sokolowsky, S, Noack, S, Schwaneberg, U and Marienhagen, J (2015). Combinatorial optimization of synthetic operons for the microbial production of p-coumaryl alcohol with escherichia coli. Microb Cell Fact 14: 79. Wang, H, Paulo, J, Kruijer, W, Boer, M, Jansen, H, Tikunov, Y, Usadel, B, van Heusden, S, Bovy, A and van Eeuwijk, F (2015). Genotype-phenotype modeling considering intermediate level of biological variation: A case study involving sensory traits, metabolites and qtls in ripe tomatoes. Mol Biosyst 11(11): 3101-3110.